They can be used to reference a GCS bucket that contains source code to be deployed on Google App Engine. They can be used to reference a docker image stored in Google Container Registry to be deployed on App Engine Flex. They can be used to reference config files (such as app.yaml) to be used during deployment to App Engine. To use an artifact to reference source code that is stored in a GCS bucket, use the “GCS” Source Type when configuring a Server Group. 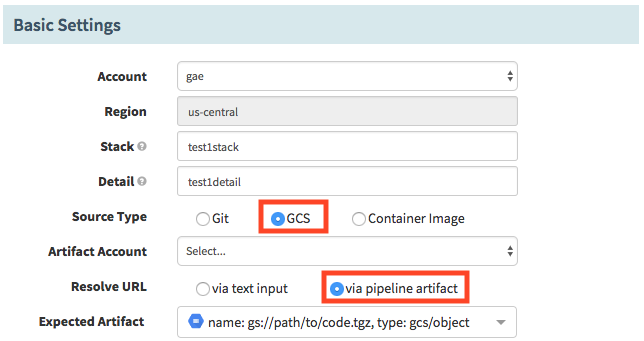 To use an artifact to reference docker images stored in Google Container Registry, set the Server Group’s Source Type to “Container Image” and set the “Resolve URL” field to “via pipeline artifact”. To use an artifact to reference config files used during deployment to App Engine, click the “Add Config Artifact” button in the Create Server Group modal.